Luxury first floor condo in a portered, newly built block of 20, right on the beautiful Maxwell beach in Christchurch. There is a shared pool for the residents and a restaurant (the Lantern at the Bougainvillea hotel) next door. A pretty garden has lounger chairs for residents and leads directly onto the beach. There is a private well equipped and air-conditioned gym with all the usual equipment in the building. Parking available in a private gated compound with 24 hour security. Sandals Hotel and Turtle Beach Hotel are a short walk along the beach, and St Lawrence gap with all its nightlife, bars and restaurants may be reached by a short taxi ride or a 20 min walk. The Oistins fish market and shops are 1.7km in the other direction along the coast. Bridgetown is 20 mins by taxi and the west coast restaurants and nightclubs about 30-45 mins depending on traffic. 15 minutes from airport. Consultant Orthopaedic Surgeon in UK. 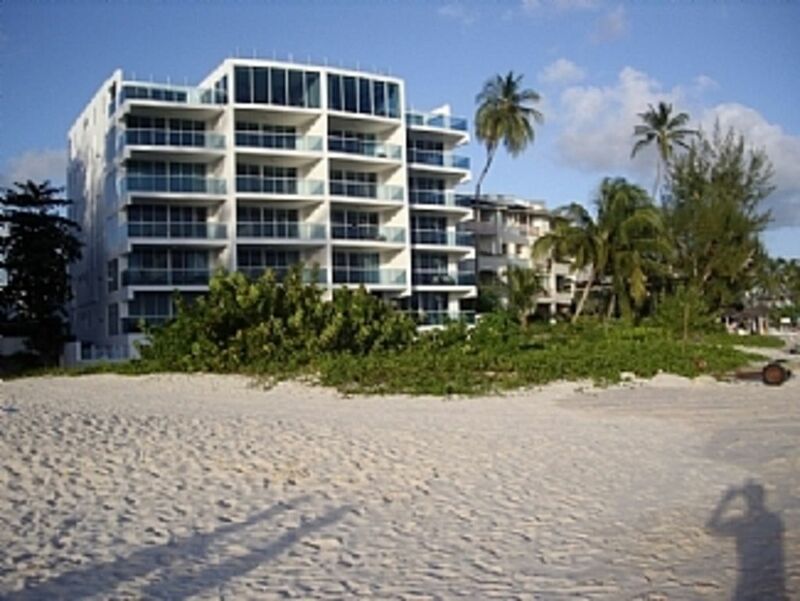 luxury private accommodation on the best beach in Barbados. Private air-conditioned gym, private pool, Jacuzzi etc. Convenience of restaurants in ST Lawrence Gap. Shower room, wc and basin en suite to bedroom 1. Bathroom with wc and basin accessible from corridor or from bedroom 2. Open plan living room has windows on two sides with view of the beach. Table for 6, armchairs and 42 inch LCD screen TV (cable TV/DVD poss). Apple Mini with broadband and 12 gB music French doors open on to large balcony with further table and chairs. Fully equipped with American fridge/freezer, cooker, microwave, dishwasher. Barbados Golf Club about 10 minutes away. Outside: Outdoor pool (10 x 3m) and two Jacuzzis (one heated) are available for residents. Utility Room: Washing machine and tumble dryer. Cleaning / Towels / Linen / Maid service: Clean linen and towels including one beach towel per person are provided once per week. Maid service available for an extra fee. Additional service on request. Other: telephone for incoming calls and outgoing local calls. Broadband and wireless router. The whole flat is air-conditioned and has ceiling fans. The apartment is on one of the very best beaches on the island. There are reasonable sized waves which make the swimming more fun, and watersports are available for hire within 100 yards. (sailing, windsurfing, jet ski, banana boats) Surfing, snorkelling, scuba diving can be arranged further round the bay. Car hire is not essential but recommended. Cars can conveniently be hired at Grantley Adams Airport and parked safely at the apartment. Having a car gives you freedom to easily visit the supermarkets, restaurants and travel round the island. There are plenty of taxis however. Oistins 1.7km (supermarket, petrol, fish market). St Lawrence Gap 2.5km (restaurants/nightlife). West coast restaurants 30 mins drive. Changeover Day: Flexible, but guests are requested to vacate the room by 3pm on the day of departure. Notes on prices: Prices are for the property per week/night in US Dollars.